Preliminarily approved as an Interstate highway by the Federal Highway Administration on September 18, 2002, Interstate 140 provides part of the bypass route for U.S. 17 around Wilmington between U.S. 421 west of the Cape Fear River to Interstate 40 south of Castle Hayne. Interstate 140 was added to the North Carolina’s Strategic Highway Corridors map on November 12, 2004. Interstate 140 was designated initially along a 6.80-mile segment of the Northern Outer Loop around Wilmington. This applied to the freeway from U.S. 17-421 east across the Northeast Cape Fear River to Interstate 40 in north Wilmington. The remaining freeway east of I-40 to Scotts Hill was signed solely as U.S. 17 and later assigned as unmarked North Carolina 140. The next section of the Outer Loop completed was the north-south stretch of freeway connecting U.S. 17 at Bishop with U.S. 74/76 west of Leland. Lacking the connection with the north leg of I-140, it was designated as North Carolina 140. Costing $211 million, the final section of I-140 between U.S. 74-76 at Leland and U.S. 421, opened to traffic on December 19, 2017. A ribbon cutting ceremony was held for the seven mile link on December 15.8 Additional construction, including work on Mt. Misery and Cedar Hill Roads, will continue as part of the Wilmington Bypass project through spring 2018.9 With the opening of the link west from LeLand, I-140 will be fully signed along the entire Outer Loop. According to the November 12, 2004, North Carolina’s Strategic Highway Corridors map, the Wilmington Bypass freeway was also planned for an extension from U.S. 17 at Bishop east to U.S. 421 south of Wilmington. U.S. 17 was realigned to bypass Wilmington upon completion of the freeway east from U.S. 421 to Scotts Hill. This changed again with AASHTO approval on May 15, 2015 to restore U.S. 17 along what was U.S. 17 Business on Market Street and other roads through Wilmington. Sign changes however were not implemented, pending completion of I-140 across the Cap Fear River. The state of North Carolina proposed designating Interstate 140 on a separate alignment previously. Involving the conversion of the U.S. 1 freeway from Interstate 40 at Raleigh southwest to U.S. 421 at Sanford, the application sent to AASHTO was disapproved by the Route Numbering Subcommittee on April 16, 1999. The decision cited that significant portions of the route did not meet current Interstate standards. Much of this route was eventually upgraded during mid-2000s construction. AASHTO approved Interstate 140 at Wilmington on May 30, 2003, and the Federal Highway Administration concurred that the route met Interstate standards in a letter dated December 15, 2008. Signage was placed on completed sections of the bypass route in August 2005. 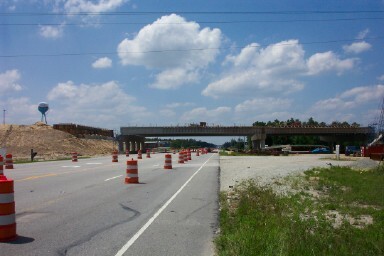 Under construction since 2011, the Leland stretch of the Wilmington Bypass was scheduled to open in September 2013. It was delayed. The final two sections, budgeted at nearly $246 million, link the two portions of I-140 between Leland and U.S. 421 in New Hanover County.4 A $125-million contract was let in September 2013 on the portion between Cedar Hill Road in Navassa and U.S. 421. This includes the construction of a 65-foot high bridge over the Cape Fear River. A contract for work between U.S. 74 & 76, west of Leland, and Navassa was awarded by spring 2014 as well. Completion of all work was scheduled for November 2017.5,7 The southern portion of the Wilmington Bypass opened to traffic between U.S. 17 and U.S. 74 & 76 on October 16, 2014.6 It renumbered from North Carolina 140 to Interstate 140 when the Leland to U.S. 421 segment opened in December 2017. Construction of the interchange joining U.S. 421 north with Interstate 140 northwest of Wilmington. Photo taken by Rob Murphy (06/03). North Carolina 133 north at the future folded diamond interchange with I-140 near Castle Hayne. Photo taken by Rob Murphy (06/03). Looking south at Interstate 40 from the Sidbury Road overpass toward the directional cloverleaf interchange with I-140. Photo taken by Rob Murphy (06/03). Interstate 140 extends 5.2 miles east from the I-40 center line through a forested and uninterrupted stretch to the merge with U.S. 17 north ahead of Scotts Hill. Photo taken 12/31/17. The John Jay Burney, Jr. Freeway comes to end at the trumpet interchange with U.S. 17 (Market Street) leading back southwest into Wilmington and U.S. 17 continue northeast to Scotts Hill and Jacksonville. Photo taken 12/31/17. Crossing into New Hanover County, U.S. 17 advances south toward the split with Interstate 140 west. Interests to Carolina Beach, Fort Fisher State Recreation Area and the North Carolina Aquarium are directed onto the Wilmington Bypass. Photo taken 12/31/17. A series of J-turns line U.S. 17 leading southwest to the exchange with I-140. Prior to 2015, U.S. 17 accompanied the John Jay Burney, Jr. Freeway west to U.S. 421 to circumvent Wilmington. The former route along Market Street was U.S. 17 Business until the state returned U.S. 17 through the city. Photo taken 12/31/17. Market Street was realigned with construction of the trumpet interchange with I-140. A loop ramp provides access to I-140 west to Interstate 40 while U.S. 17 continues north along a single lane ramp toward Scotts Hill. Photo taken 12/31/17. Two miles ahead of the directional-cloverleaf interchange with Interstate 40 on I-140 east. I-40 travels north-south between Wilmington and the Raleigh-Durham area. Photo taken 11/11/06. Interstate 40 ends two miles south of I-140 at its merge with U.S. 117 & North Carolina 132. Benson, the crossroads of Interstates 40 and 95, represents the westbound control city in place of Raleigh. Photo taken 11/11/06. Drivers bound for Interstate 40 depart from I-140 east in unison at an unnumbered off-ramp. Interstate 140 ended here, with the remaining six miles of freeway to Scotts Hill at the Pender County line signed as U.S. 17 and designated as N.C. 140. Photo taken 11/11/06. The off-ramp to Interstate 40 partitions traffic to eastbound for Wilmington and Wrightsville Beach, via the connection with U.S. 74 & 76. Raleigh appears on the westbound panel for Interstate 40; the capital city lies 115 miles to the north. Photo taken 11/11/06. U.S. 17 southbound on the approach to Interstate 40 north of Wilmington. There are no interchanges between the freeway beginning near Scotts Hill and I-40. Photo taken 11/11/06. One mile out from the directional-cloverleaf interchange between Interstate 40, 140, and U.S. 17. Interstate 40 ends 3.75 miles to the south at the merge with U.S. 117 and North Carolina 132. Photo taken 11/11/06. A collector distributor roadway separates from the freeway mainline for the east and westbound ramps to Interstate 40. Shallotte accompanies Myrtle Beach as the control cities for the continuation of U.S. 17 south from Wilmington. Photo taken 11/11/06. Drivers bound for I-40 west to Benson (Interstate 95), Raleigh and Durham depart Interstate 140 west. Interstate 40 next meets Holly Shelter Road two miles to the north at Exit 414. Photo taken 11/11/06. The westbound beginning of Interstate 140 was formally marked at the bridges across I-40. Photo taken 11/11/06. South of I-140, Interstate 40 concludes at the merge with U.S. 117 & North Carolina 132 (College Road) southbound ahead of U.S. 74 (Martin Luther King, Jr. Parkway). Photo taken 11/11/06. Exits 416A/B join I-40 east with Interstate 140 west and U.S. 17 south, 1.25 miles from the Holly Shelter Road on-ramp. Photo taken 11/11/06. Interstate 140 provides a high speed route to U.S. 17 north to Topsail Beach and south to Myrtle Beach, South Carolina in addition to the inland cities of Jacksonville and New Bern. Photo taken 11/11/06. Exit 416 splits from the I-40 eastbound mainline as a c/d roadway for Interstate 140 west to Leland and Shallotte and east to Scotts Hill and Topsail Island. Photo taken 11/11/06. Leaving Wilmington on Interstate 40 west, two miles ahead of Exit 416 for U.S. 17 north to Jacksonville and U.S. 17 south to Myrtle Beach, South Carolina. Photo taken 11/11/06. One mile south of the directional-cloverleaf interchange (Exits 416A/B) with Interstate 140 west and U.S. 17 on I-40 west. Interstate 140 & U.S. 17 traveled six miles west to U.S. 421 (Independence Boulevard Extension). U.S. 17 traveled six miles east to overtake U.S. 17 Business near Scotts Hill. Photo taken 11/11/06. Exit 416B departed Interstate 40 westbound for the N.C. 140 freeway east to Scotts Hill and Jacksonville. Jacksonville lies 42 miles northeastward at U.S. 258. Photo taken 11/11/06. Interstate 140 makes a gradual S-curve on the one mile approach to Exit 1 with U.S. 17 (Ocean Highway) north. Photo taken 12/31/17. The freeway mainline defaults onto U.S. 17 south ahead of Bishop and Town Creek. Shallotte lies 25 miles to the southwest. Photo taken 12/31/17. Although still posted as N.C. 140 when the last section of I-140 opened, an end shield for Interstate 140 was added at the trumpet interchange (Exit 1) with U.S. 17. Photo taken 12/31/17. One mile east of I-140 on U.S. 17 south by Lanvale. Signs for the freeway included green outs for Benson, the control of I-40 leading north from Wilmington. Photo taken 12/31/17. 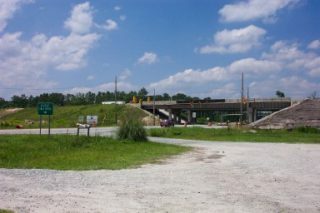 Similar to the east end of I-140, construction of the trumpet interchange with U.S. 17 included the realignment of the US route to accommodate the exchange. Photo taken 12/31/17. Traveling north through Bishop along U.S. 17 on the one mile approach to Interstate 140 east to U.S. 74 & 76 near Leland and I-40. Photo taken 12/31/17. North Carolina 87 stems north from U.S. 17 just prior to Interstate 140. The rural state route winds northwesterly to U.S. 74 & 76 near Maco. Opening of I-140 provided a higher speed and more direct route to the US highways leading west to Whiteville. Photo taken 12/31/17. 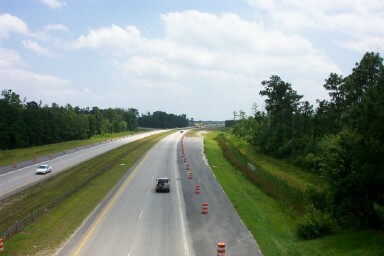 Signed as Exit 39, two-lanes depart from U.S. 17 north for Interstate 140 to bypass Wilmington. U.S. 17 angles 5.4 miles northeast to combine with U.S. 74 & 76 at Belville. Photo taken 12/31/17. Preparing to cross the Cape Fear River on Interstate 140 west & U.S. 17 south, two miles east of the freeway end at U.S. 421 (Independence Boulevard Extension). Photo taken 11/11/06. A high-level bridge carries the freeway over the Northeast Cape Fear River by industrial areas north of Wilmington. U.S. 421 follows Independence Boulevard Extension northward from U.S. 17 & 76 near Belville. U.S. 17 was relocated from Market Street through Wilmington along a combination of U.S. 421 and I-140 to bypass the city to the north. U.S. 17 & 421 overlapped for two miles southward from the temporary end of I-140. Photo taken 11/11/06. All traffic departed from the west end of the NE Cape Fear River bridge to connect with U.S. 421 south of Wards Corner. U.S. 421 joins Wilmington with Clinton to the north on a parallel alignment to Interstate 40. Photo taken 11/11/06. Plastic pylons directed motorists onto the loop ramp for U.S. 421 just ahead of the stub end for I-140. Photo taken 11/11/06. End Interstate 140 marker posted along the loop ramp to U.S. 421 (Independence Boulevard Extension). Photo taken 11/11/06. Two miles south of I-140, U.S. 421 combines with U.S. 76 east into Wilmington while U.S. 17 travels an older freeway with U.S. 74-76 west to Leland. U.S. 17 continues southwest from Leland on a four-lane divided highway 32 miles to Shallotte in Brunswick County. Photo taken 11/11/06. U.S. 421 (Independence Boulevard Extension) south at I-140 east and U.S. 17 north. I-140 & U.S. 17 arc northward across the Northeast Cape Fear River on a high-level bridge toward North Carolina 133 (Castle Hayne Road). U.S. 17 joins Wilmington with Jacksonville and New Bern in the northeast. Photo taken 11/11/06. A begin shield for Interstate 140 stood along the on-ramp from U.S. 421 to the Dan Cameron Bridge across the NE Cape Fear River. Until 2015, U.S. 17 followed all of the 12-mile freeway between U.S. 421 and U.S. 17 Business near Scotts Hill. Photo taken 11/11/06. “First leg of bypass set to open.” The Wilmington Star, August 19, 2005. “GOV. EASLEY OPENS FIRST STRETCH OF I-140 WILMINGTON BYPASS.” NC Office of the Governor News Release, August 22, 2005. “I-140 Wilmington Outer Loop,” Robert Malme. “Opening delayed for Leland stretch of Wilmington Bypass.” Port City Daily (Wilmington, NC), August 28, 2013. “Leland officials pleased with I-140 plans.” StarNews (Wilmington, NC), September 29, 2013. “Southern section of Wilmington bypass to open.” StarNews (Wilmington, NC), October 15, 2014. “Brunswick County expected to benefit from I-140 bypass.” StarNews (Wilmington, NC), November 11, 2016. “Last stretch of I-140 opens.&quot. StarNews (Wilmington, NC), December 19, 2017. “Wilmington I-140 bypass scheduled to open Dec. 15.&quot. StarNews (Wilmington, NC), October 28, 2017. Page updated on January 11, 2018.